Buried in the depths of NRMP Data, I came across this very interesting piece of information. It deals with the number of applicants that the programs have to rank for the specialty to fill all the positions. So, what does this have to do with your match chances? Simply put the longer the list of applicants that the programs put up, the higher the chances of you matching. Now this is not the only factor and is a part of all factors that increase your chances of match success. This is easily an effect of inclusion, where more applicants are included in the list for that one spot. All things being equal and the numerical order set aside, the fact that you will feature on the list means that you will be called for an interview and therefore have a chance to work your magic at impressing the program and thus move up on the list. In this case, there is 50 % chance that position will go unfilled, an outcome which no program directors wants to face. But if the program is confident that the one applicant that have ranked is enough then their ROL will be 1 app. So assume he increases the program ROL to 2. now, the following happens. The implications of a longer ROL by programs to include more ranked applicants to fill each position are two-fold, 1. They allow for more applicants to be ranked and 2. Increase the number of applicants interviewed in the succeeding year. Thus using the projections, it can be expected that more applicants will be interviewed for peds, IM, FM and pathology with the greatest increase in number of applicants interviewed and ranked in radiology. 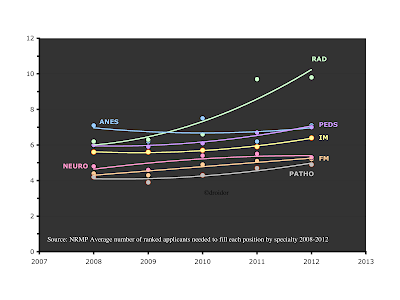 Anesthesia will likely remain the same and neurology will actually see a reduction in the number of projected interviews. In conclusion, the way things stand, neurology is going to get tougher, radiology easier that what it is and others will more or less stay on the current projected course. Hey. I have been reading your blog. Very interesting topics and thanks for everything. Concerning this topic, I was actually thinking that if there are more applicants, then it would be more difficult to match? Because you have more competition? But I do not have a good grip on this whole NRMP thing like you, so I might not be getting it. On the other hand, we are 2014 now, and I have heard that Radiology has become VERY difficult, especially for IMGs. Very competitive, and even more coveted than general surgery.